The Solo Rider is as capable on the tee as it is on the green. And it can handle the steepest of golf course terrain. 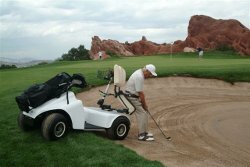 It operates with hand controls, and the seat swivels to allow the golfer to access his or her ball outside the cart, while also supporting the golfer when he or she swings. It’s an amazing piece of technology that can keep a golfer playing the sport he or she loves well after he or she would have quit the sport because of poor mobility. And the Solo Rider is also the perfect accompaniment to other types of outdoor recreation including hiking, fishing, etc. The uses for it are practically endless. A person should not have to quit the activities they love so dearly in life because they have poor mobility. So, if you have any questions as to how you or your loved one can benefit from a Solo Rider, then call the mobility experts at G and J Enterprises today.